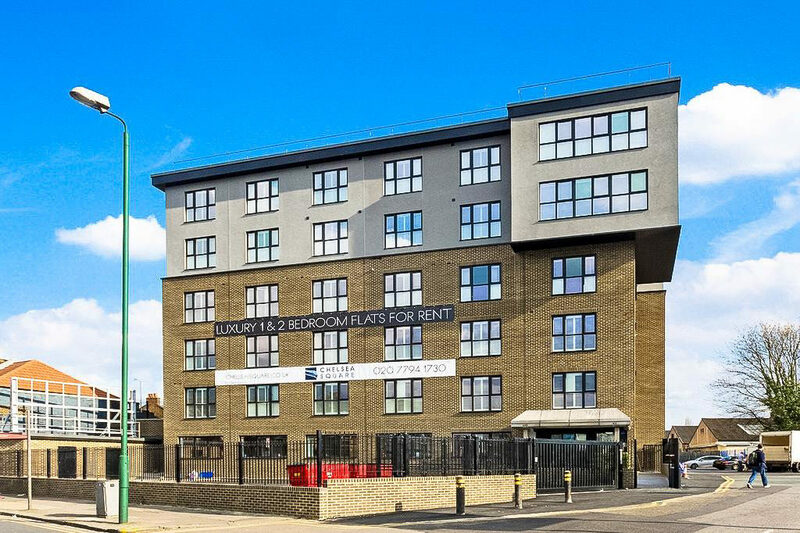 Moran House is a semi-new build residential development carried out by MP Moran & Sons Ltd to provide 27 new apartments in the busy London borough of Brent. Close to Wembley Stadium, the area is regarded as affluent and the increasing buzz means that this is a desirable spot to live and work. Moran House was a project which was planned and developed by MP Moran & Sons. £2m was invested by the company to transform the offices they maintained into 27 luxury 1 & 2 bedroom apartments. Planning permission was granted to allow two further storeys to extend the existing building to allow for the addition of more units. The main contractor was MP Moran, therefore the ‘self-build’ nature of the project allowed with them to consult directly with the enlisted architects, David Bellis Architects, to give them exactly what they wanted. Martin Moran, Director of MP Moran, appointed Resistant’s Multi-Rend board as the key external render carrier board for the two new floors of the building. The design brief had a simple target, to create an elegant transformation of a building to suit the surrounding areas and create additional housing in the heart of the busy London borough. Resistant’s Multi-Rend board was specified for use at the request of the main contractors, MP Moran. 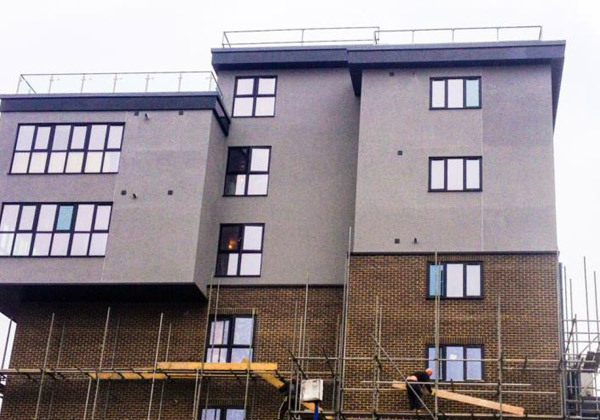 It was specified that the project needed a render carrier board which would allow the use of a coloured render product on top, as well as being reasonably priced and easy to work with. The BBA certified Multi-Rend board was therefore requested for use as it was able to fulfil all of these requests. The biggest installation challenges revolved around the board being specified for use on the top two floors of an already existing building. 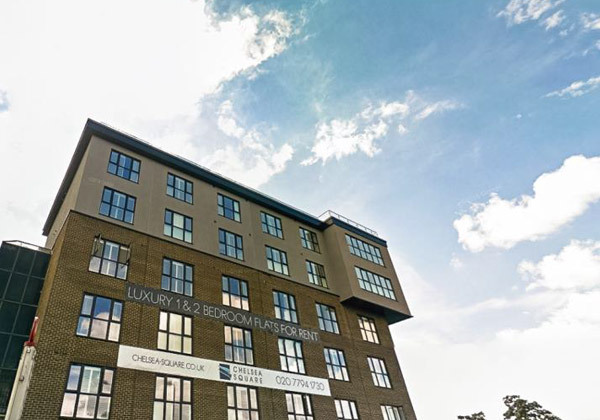 This meant that the render boards needed to be lifted to a 5 storey height from a busy street, fixed and finished, while being openly exposed to the elements and also within a tight timescale. Martin Moran, Director of MP Moran, and the head of the project, specifically requested the use of Multi-Rend for its ability to be exposed during construction, as well as its ease of use. He stated that due to Multi-Rend’s light weight sheets, they were more beneficial in comparison to alternative boards as they had to be brought up 5 floors. As the boards are easy to cut by the score and snap method, it meant the installation process was much more efficient compared to using boards which required the use of power tools or specialized cutting blades, especially when it came to working at heights and transporting equipment from ground level to the fifth storey of the building. Multi-Rend is moisture resistant by means of its shape, thickness and integrity are unaffected by moisture. As the boards did not require protection during the construction phase, it sped up the process of completing the envelope of the building. 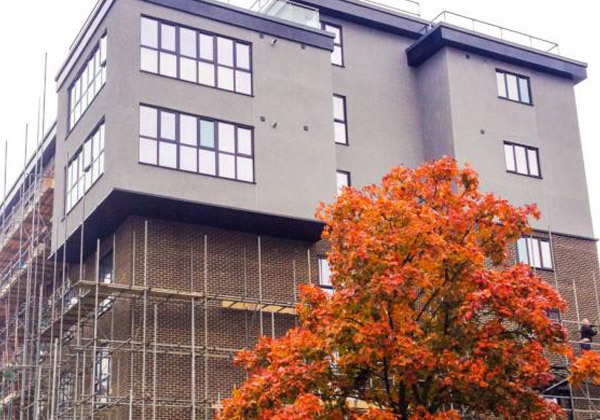 The Multi-Rend board was finished using a coloured cement-based lightweight render system to compliment the aesthetics of the beautifully designed apartment complex. London is one of the busiest cities in the UK and residential development demand is on the rise. The ability to finish a construction on time, on budget and with an aesthetically pleasing finish is a goal that every developer wants. Resistant’s Multi-Rend board allowed all of these things to happen and performed so well that it is being promoted for further use. It is a necessity for people to live in an environment that they are comfortable in and that gives them what they need and the apartments situated in Moran House provide this. Martin Moran has stated that “We need simple solutions for our projects.” – this is the reason he chose to use Resistant’s Multi-Rend render carrier board, and would do so again. It’s ease of use, workability and economic cost benefited the £2m Moran House project in many ways. Further to this project he has stated that he would recommend Multi-Rend to other contractors and customers, and he has already done so! Subscribe to our Newsletter and get the latest updates. No spam!